On Thursday, July 27, 2017, Boston Poet Laureate and Mass Cultural Council Fellow Danielle Legros Georges will celebrate the publication of City of Notions: An Anthology of Contemporary Boston Poems with a public reading in the courtyard of the Boston Public Library. The event begins with welcome remarks by the City of Boston’s Chief of Arts and Culture Julie Burros, at 6 PM. Danielle and other contributors will read their poems about Boston, which earned the nickname “City of Notions” in the 19th century (according to Wikipedia). The anthology includes work by Elizabeth Alexander, Julia Alvarez, Margaret Atwood, Stephen Burt, Nick Flynn, Gail Mazur, and many others. Past Mass Cultural Council awardees published in the collection include Charles Coe, Steven Cramer, Gary Duehr, Regie O’Hare Gibson, Holly Guran, and Anna V.Q. Ross. 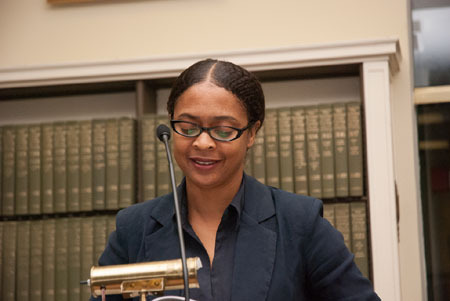 Image: Danielle Legros Georges reading at the American Antiquarian Society in 2013, photo by Phillip McAlary. Where can we buy the anthology if we cannot attend the reading?